As more and more Russians seek solace in patriotism, many are turning to their ancient past and reviving pagan traditions. Apart from various festivities, Slavic traditions are being revived in songs, clothing, martial arts and even psychotherapy. According to sociologists, this interest in the past is becoming a trend in Russia. It doesn’t appear on the official state calendar as a holiday, but on July 20 groups of Russians around the country gathered to celebrate one of the nation’s oldest festivals by lighting fires, dancing and fighting. July 20 is known in Russia as Perun’s Day – an ancient Slavic holiday dedicated both to the eponymous Slavic god of thunder and to warriors. The holiday, which used to be one of the most important events in the Slavic tradition, persists in modern Russia. Perun’s Day (named after the Slavic god of thunder and ruler of the pantheon) is dedicated to warriors. It is believed that on this day, Slavic men used to sacrifice a rooster or a bull in order to wash their weapons in the animal’s blood. Of course, nothing of the sort happens today, said Yelizaveta Timoshkina, co-founder of the Slavic culture reenactment club Bely Bars (“White Leopard”). The modern rendition of Perun’s Day involves lighting big fires, after which men start fighting one on one, explained Timoshkina. The victors are rewarded with special talismans – badges made of brass, copper or silver, with designs being based on amulets found by archeologists during excavations of ancient burial mounds. 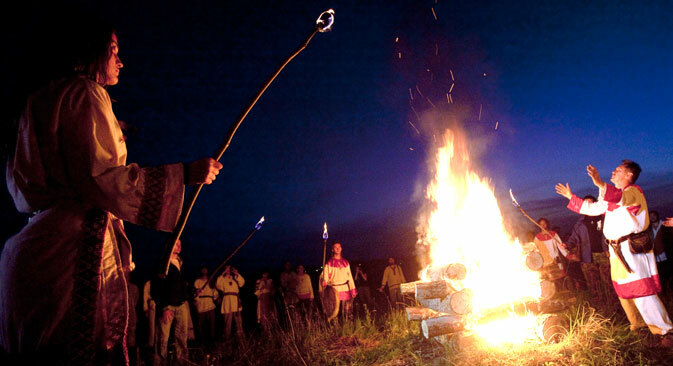 As soon as it gets dark, all the men present form a khorovod (circle dance) around one of the fires and start circling it while holding hands. They try reaching maximum speed without falling into the fire, which is supposed to show their strength and agility. Of course, the re-enactments of ancient holidays are simply inconceivable without reproducing traditional national pastimes – including bare-knuckle boxing. According to martial arts historian Alexei Leshachkov, while the Slavs did not have martial arts as such – or at least, no such system is mentioned in written accounts – they did enjoy bare-knuckle boxing. Boys would start learning to fight at an early age, engaging in various fighting games like “Wall to Wall” (a competition between two groups of fighters trying to push their opponents away from a certain zone) or “King of the Hill” (when someone tried to stay on top of a hill while others pushed him away in an effort to become the new “King”). Nevertheless, there are some schools of the “Russian martial art” in the country. “Those schools showcase this technique as the traditional Slavic martial art, but this is just a marketing ploy,” said Leshachkov. “In fact, this form of combat was invented in the end of the 20th century.” According to the historian, the “Russian martial art” is an amalgamation of boxing, sambo and karate techniques. The revival of Slavic traditions is finding some use in modern applied psychology. For instance, the Moscow-based Ladoga coaching center actively employs the rites of the past in its activities. Psychologist Olga Kolyada, one of the center’s managers, says traditional culture contains the secrets of how to live happily. “We discover the ways of our ancestors. For example, we revive the traditional Slavic singing. The Slavs used their voice to get through grief – the weeping of women during funerals come to mind. We use those techniques today to help people endure traumatic events through their voice,” she explained.